Clean: Snip them about 1/2″ from the base of the flower, unless you’re extra-lucky and already have small courgetttes attached, in which case you can grab those too. Open the blossoms carefully while you’re outside and make sure there are no insects inside–watch out for bees who might hang out in there. Then give them just the quickest rinse under a sprinkling of water and gently pat dry. Trim: Using a small sharp knife like a paring knife, snip and discard the tiny sharp leaves attached to the stem. Cut and discard the stamen from inside the blossoms: for large ones you may be able to reach in with your knife but for small blossoms, it’s okay to make a tear between petals to the base to get the tip of your knife in. When you’re stuffing the blossoms you can fold those petals over each other to close the cut. Tips: Use the day you pluck them or maybe one day after if you store them in the fridge in a loose plastic bag (pre-wash). When frying stuffed blossoms, work in small batches and keep fried blossoms in a low (200F degree) oven on a parchment paper-lined baking tray until ready to eat (and might I recommend a simple, sweet tomato sauce for dipping.) But blossoms are also great unstuffed on pizza, in omelettes, or fried unstuffed with or without batter though those tend to soak up oil and will need to rest on paper towels instead of in the oven before enjoying. 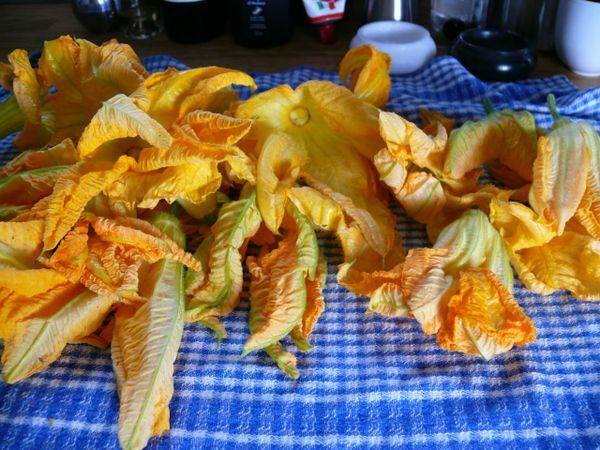 the end of summer passed and between my foiled attempts at growing anything in my backyard, and my stubborn refusal to pay exorbitant prices for squash blossoms that were abundant and free in other people’s backyards everywhere, i didn’t have a bite of one all season. 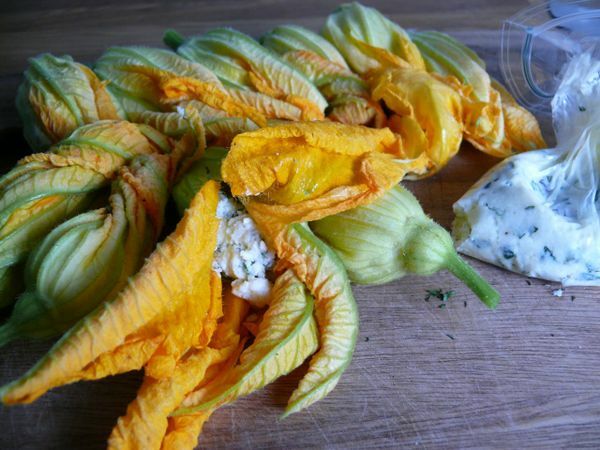 but on the second official day of fall, just before this new cold snap hit, i finally found myself with 20 perfect, large zucchini blossoms. my very thoughtful co-worker asked her very generous nonna (grandmother) to pick some from her garden for me. 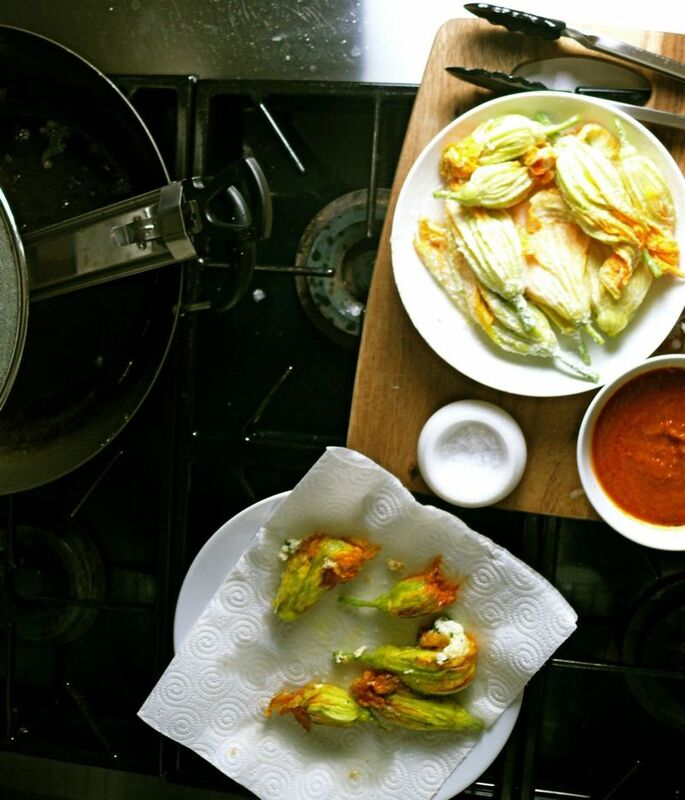 with some leftover sauce from a recent dinner and using this simple recipe from gourmet, james and i planed to be eating fried blossoms full of ricotta in a matter of minutes. we set the table and even opened a nice bottle of wine. except these never made it to the table. we fried a batch, sprinkled some maldon salt on top, waited till they were just a degree cooler than scalding to “try one” while we fried up another batch, but there was no closing that door. we ate every one standing over the stove. probably the best idea, really, to have them while they were still perfectly crisp and delicate, before the moisture from the heat threatened to make the lightly battered petals soggy. * so delicate. a delicacy even. and only about 360 days until i can enjoy them again. farewell, mediocre summer, at least this last memory was a good one. Gorgeous. 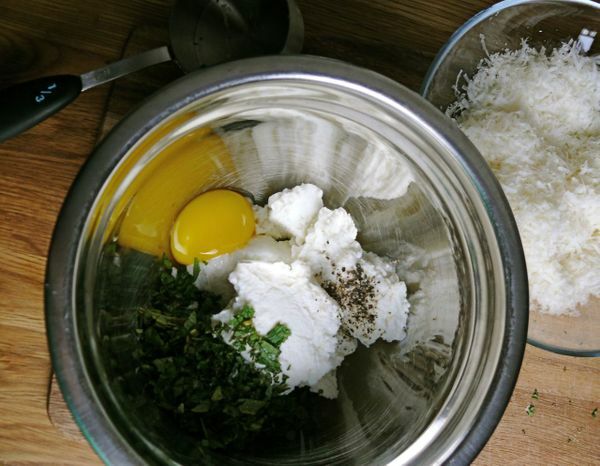 I’m surprised you didn’t do it Jamie Oliver-style and cut up some Thai chilies into the ricotta mix! !